Looking to buy a new appliance? Just remember that you have to get rid of your old one first. 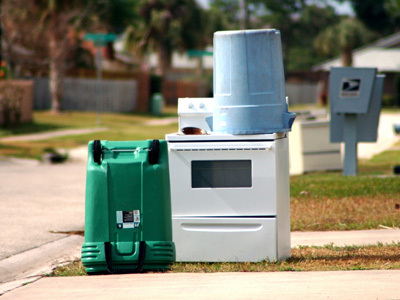 While you might be tempted to simply throw out your old appliance, many waste management companies might not accept these kinds of items, especially if they weigh several hundred pounds. But tossing your old appliances into the landfill is also bad for the environment. Many appliances, including air conditioners and refrigerators, use chlorofluorocarbons to cool the air, which contribute to ozone depletion. Burning these appliances in a landfill will release these chlorofluorocarbons into the air, but you can avoid this if you have them recycled instead. Not sure how to recycle your old appliances? We’ve got you covered. Your first step will be to find an appliance recycling company in your area. You can try doing a simple Google search, contacting your municipality or EPA office, or you can search for these kinds of companies at Consumer Energy or on the official EPA website. If you’re thinking about recycling one of your old appliances, chances are you need to order a new one. In that case, you can try finding an appliance manufacturer in your area that’s willing to haul away your old appliance at no extra charge or for a small fee. You can kill two birds with one stone and feel good about saving the environment. Does your old appliance still work? If it does, you can always donate it to someone in need. Take a few minutes to reach out to some non-profit organizations in your area and see if they need whatever you’re trying to get rid of. Why recycle when you can give your old appliance a new life? As you get ready to recycle your appliances, make sure you give the appliance enough time to cool down. Unplug the machine and let it rest for a few days before you try to shimmy it onto a truck or have a local company move it for you. Otherwise, the appliance may still be overheated, which can cause injury during the moving process. You might also want to wear gloves if you’re trying to move the appliance yourself in case you encounter a hot surface or leaking chemicals. Don’t forget to seal all appliance doors and openings before you start moving your appliance. Grab a roll of duct tape and secure these openings to make sure they don’t fly open in the middle of your move. No one wants to get whacked in the head by a freezer door. If you’re not ready to recycle your old appliance, consider calling the appliance repair professionals at Absolute Appliance Repair in San Francisco Bay.